Lower Elwha Klallam Tribe (LEKT) member Roger Fernandes and The Legacy Gallery organized an Art Show on May 23rd at the Lower Elwha Klallam Heritage Center in Port Angeles. After visiting Port Angeles last June to see the Elwha River Restoration, (see blog), I was eager to attend. 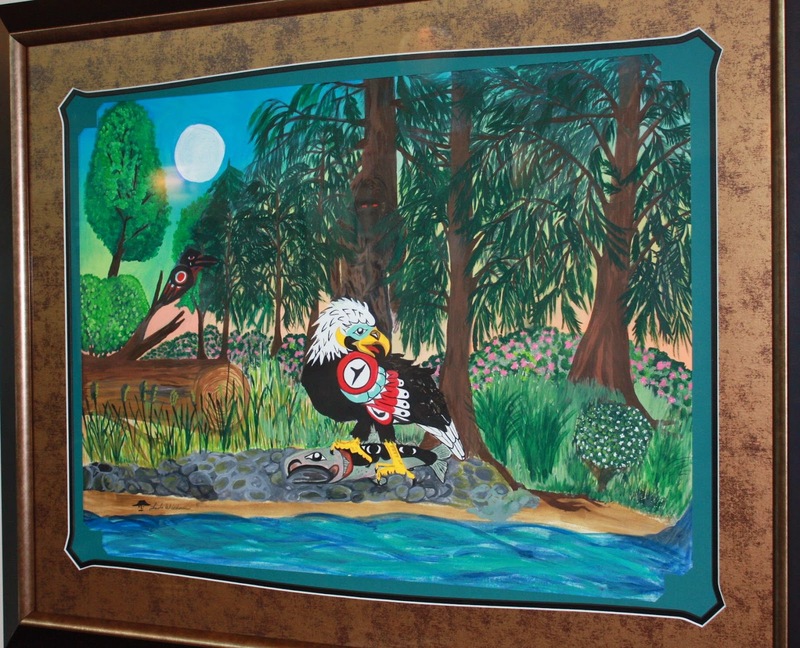 LEKT artists Linda Wiechman, Darrell Charles, and Roger Fernandes exhibited their work, ranging from paintings to drumheads to carved canoe paddles like the one pictured above. The focus was the impact that removing the Elwha River dams has had on the tribe and the environment. Linda and Roger led a panel discussion, and among those who attended were LEKT Council chairman Francis Charles and former Tribal Council member Dennis 'Sully' Sullivan. The Elwha and Glines Canyon dams blocked the salmon from migrating up the Elwha River to spawn. The chinook would swim 5 miles upriver and find themselves blocked by the Elwha Dam. They hung in the water beneath the dam. In the first years after the dam was built, the salmon would smash their heads against the dam until the river was bloody. Salmon runs have dwindled since the dams were built, and some have gone extinct. In native lore, salmon are the Salmon People who live in villages under the ocean and come back to the rivers to feed the people. Roger told us, We are the salmon people. Our culture is built around salmon. Northwest tribes have many traditional stories about the salmon. 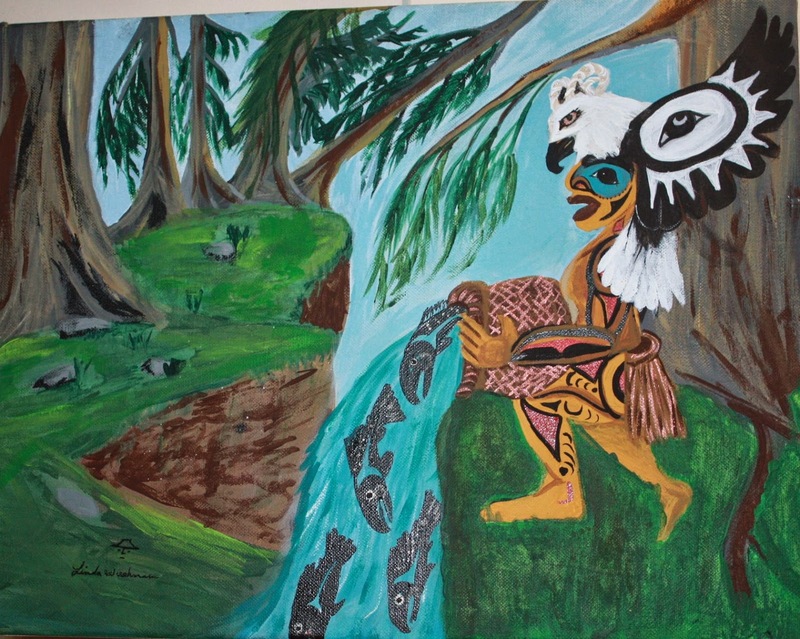 The artists reported that when they were children, their parents and elders told them the dams would come down someday. The tribe's struggle to make that happen lasted for 30 years. It wasn't a political struggle, it was spiritual, a battle for a way of life. The LEKT never gave up. Roger said, They don't call us 'The Strong People' for nothing. For the Lower Elwha Klallam Tribe, the Elwha River Restoration means recovery of the salmon and the ecosystem. Linda Wiechman said, The river is life. Releasing the dams brings life back to the salmon people, and salmon bring back the whole ecosystem. Salmon are good medicine. Roger Fernandes said, Removing the dams is a huge statement about environmental wellness. When the salmon return, the ecology returns. According to Tribal Council Chairman Francis Charles, We do this for the children, for the future. Sully Sullivan recalled that when he was a child, fishing by tribal members was illegal. He and his friends learned to hide from the game warden and families hid their smoked salmon under their beds. But the people never stopped fishing. Linda's painting, Elementals of Nature, depicts the recovering ecosystem. The river runs through cedar forest and snowberries. Eagle stands about to feed on a salmon whose remains will enrich the riverbank. Kingfisher observes, and so does Sasquatch, a shy being who stays in the background. Can you find the Sasquatch in the trees? 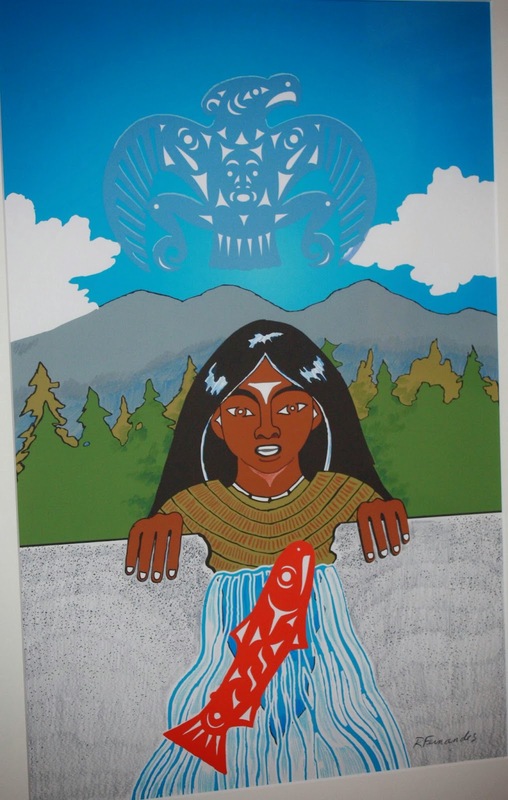 Another of Linda's paintings, The Changer, shows a mythical being who has created the salmon. Releasing the salmon into the river will restore the ecosystem. Roger Fernandes' painting, Lady of the Mountain Breaks the Dam depicts the mythical woman who sleeps. She helped make creation, then went to the mountains, promising to come back if ever she was needed. Here she is, tearing down the dam so the natural world can come back. As she frees the river, a salmon swims upstream. Thunderbird overlooks the scene; in native lore, Thunderbird drives the salmon up the river. Roger Fernandes says, The river is free, the salmon are returning. But removing the dams is not the end, it's the beginning of something. It's still a figuring-out process. We changed the world, the environment is being re-established. Now we have to figure out what to do with that. Roger plans to bring the art show to The Legacy Gallery in Seattle this summer. As for the ongoing Elwha River Restoration, new beaches are forming at the mouth of the river and marine life is showing up that's been missing for decades. Dive surveys in the summer of 2013 found juvenile crabs on the floor of the strait off the river mouth. Crab pots are being set near the mouth of the river. The Elwha Water Facilities Project, Port Angeles' water treatment plant that shut down because of river sediment, is operating again. And less than 30 feet of the Glines Canyon Dam remains to be torn down. Dam removal will resume after the spring river flows slow, and after June 30th when the fish migration ends. Dam removal is scheduled to be completed in fall, 2014. For more about the Elwha River Restoration, take a look at our blog series.